A Missouri state senator says St. Louis could lose the Missouri Valley Conference basketball tournament and other major events, unless lawmakers approve legislation allowing the state to help fund Scottrade Center renovations. The Scottrade Center is where the NHL’s Blues play. 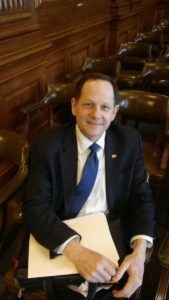 State Sen. Dave Schatz (R-Sullivan) has filed legislation to allow state funding for land clearance projects “related to tourism infrastructure facilities”. The measure comes at a time when Missouri faces a tight state budget, with departments facing possible budget cuts. The Schatz bill would allow up to $6 million in state funding annually to pay for renovations at the Scottrade Center, which was built in 1994. Schatz testifies St. Louis will lose bids on several upcoming events, if upgrades aren’t made. “The NCAA men’s Final Four Frozen Four, the NCAA division I wrestling, NCAA women’s volleyball championships, the 2022 World Junior Hockey,” Schatz says. St. Louis Mayor Francis Slay and other supporters of Scottrade Center improvements say the 23-year-old facility’s plumbing and mechanical systems are failing. Slay tells Missourinet supporters are asking the state for about $65 million to help fund improvements. Schatz testifies that the Scottrade Center generates significant revenues for the state. Schatz also says Scottrade Center/Peabody Opera House is responsible for filling 55,000 hotel rooms in the region annually. State Sen. Jamilah Nasheed (D-St. Louis) says visitors to Scottrade Center and Peabody Opera House put more than 85,000 people to work in bars, hotels, restaurants and other region venues. The “St. Louis Post-Dispatch” reports the St. Louis Board of Aldermen has approved issuing $64 million in bonds, and that the Blues ownership group plans to chip in $50 million over the next 20 to 30 years. Zimmerman, who supports the Schatz bill, testified Tuesday before the Senate Economic Development Committee. The packet also says that the Scottrade Center building lighting controls are “operating from Windows 95”, and that the building still has its original 1994 emergency power generator. Zimmerman testifies this project is about creating jobs and keeping St. Louis “vibrant”. He tells senators Scottrade renovations will produce about 2,200 on-site construction jobs. Missouri state senators also learned Tuesday that St. Louis hopes to land the NHL all-star game. Longtime St. Louis Sports Commission board member Jack Stapleton made the announcement while testifying before the committee. But Stapleton testifies that the Scottrade Center needs major renovation work. He also supports the Schatz bill. The committee did not vote on Tuesday, and a vote is not expected until senators return from the legislative spring break.